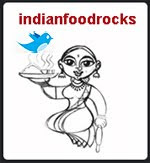 Indian Food Rocks: IFR: Where's the Recipe? It's on yer blogs! Most of them anyway! Indosungod's lime pickle in its first stage, cooking in the sun. The large man's handkerchief has been put to good use yet again. It rained and the several thick layers of good quality cotton, that can only be found in India, held it at bay. 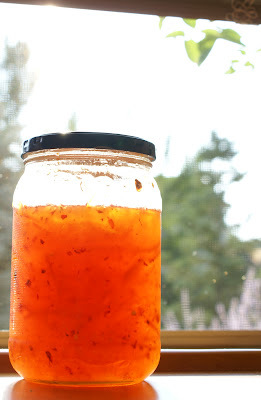 Grapefruit pickle. Thanks, Pel, for the idea. The pickle masala is just like my lemon pickle. I used 3 medium sized grapefruits instead of lemons. Mixed veggie pickle. Thanks, Roopa, for the idea. I made this just like my lime pickle and added 2 carrots and reduced the limes to 7 instead of 9. My lemon pickle, because I am all out! Also, in progress, is adamaanga, a sun-dried mango pickle from Ammini's Grains, Greens and Grated Coconuts. I don't have pictures for that yet. Grapefruit marmalade. Thank you, Anita! I used 1 medium sized grapefruit instead of limes. My pectin syrup was almost non-existent because the grapefruit didn't have any pips and the limes and lemons used in the pickles above yielded a measly amount of pips. No matter, it's delightful! It is more bitter than orange marmalade and a must for karela lovers! Okra salad. Thank you, Gini! I finally made it even though the okra was not that great. We had it for dinner tonight, with Greek pitas toasted in the oven. From my garden to yours...I hope you had a wonderful relaxing weekend. You've been busy in the kitchen too! I was right, you made grapefruit marmalade!!! And the grapefruit pickle should be interesting - no need to add sugar I suppose? The mixed veggie-lemon pickle is how me mum makes it too - but I don't add heeng, that is the only difference. Anita, everything except the grapefruit pickle was put together this weekend. It cooled off wonderfully on Friday and has stayed in the 80s and high 70s since. What a relief! And we got some rain, too! I cooked on Friday, too. For my Flickr buddy who stopped by on her way out of Colorado, back home to CT.
LOL! Sometimes even the best of us make mistakes. I should know! ;-) How's that for some self-thumping of one's own back?! Anita, are we on for the sun-dried yogurt? Should I scout for a recipe? Or are you suffering the onslaught of the monsoons? Pel? Anyone else game? Oh my goodness i am drooling at those jars of pickles.... lucky i just finished my lunch. Grapefruit pickle??? What if it's orange? Will it work?? I have plenty of sunshine (read 45-50 degrees C ) which should cook the pickles in a day or two!! I would definitely love to do this, but August will stay very damp...it is usually the rainiest month in Delhi..but the sun does come out everyday...you look for a recipe and we'll see. Definitely in Sept anyway. If I can make mashherkreya at home, it'll be a dream realized! Enough of your pickles already! Sun-dried yoghurt? Yep! I'm game...and that's used for...let me think...the gravies for cooking meat in some country or other right? Lebanon? Syria? Am I close? Grape fruit Marmalade is to die for! YUM!!!! Roopa, lunch? What does lunch have to do with it? I can be found grabbing a spoonful at any time of the day or night! Try it! My husband's face was worth seeing the first time I got caught with my hand in the pickle jar in the middle of the night! Jyothsna, it should. Pel has pickled blood oranges. You might need to add some lemon juice though - I'm guessing so don't take my word for it. Anita, does your Mom want to share her recipe? Not much she can leave out by way of ingredients! :-D I'll start looking for a recipe. And it looks like Pel is in, too! Pel, it's delicious on toast. Anita suggested removing the pith, which I didn't do. I will do that the next time I make grapefruit marmalade. Do tell her how it is, Pel! So what if JK Rowlings had to substitute Sorcerer for Philosopher, it's still handkerchief this side of the pond! And if it's a large man's handkerchief, all the better. No disputing that fact, Asha! Whether she did or did not want to share her recipe, she gave me a jar of the pickle, and we loved it...I looked at your spice proportions, tweaked them just a teeny weeny bit, and made some - it is ready and I think I nailed it! I'd love to be a fly on the wall when Pel has his Umreeki friends taste Indian pickle! Middle of the night pickle snacking, Manisha? Was it when you were , in the family way, as they say? And you got caught even at that time of day/night?! It's hilarious Anita! It's such a total shock to the usual Umrikan palette... If I can get a scene on the digicam, I'll post it on youtube and let you know; me, I'm quite fond of it with rice and yoghurt- simple, tasty snack for any time of the day (or night). So, which of you has the recipe for dried yoghurt? Thats a nice stock of pickles Manisha. I asked my mom to make as many as pickles and sun dried items while she is here. Sun decided to disappear exactly when we started our first batch of wadis :(. grapefruit marmalade looks so clear and luscious. wow, so many pickles. Manisha: looks like you added the pepper flakes too? Pel: More than the palette, it is also what you anticipate when you decide to put 'pickle' in your mouth - our pickles are an entirely different animal! I remember when a few friends I had over for dinner helped themselves to mango 'pickle' - I warned them but they were not expecting hing and a burst of chillies in there, I can assure you! At the same time, I had another friend in Grad school, a vegetarian, who took to curd-rice and Andhra pickles like the proverbial fish to water. She got herself some from the lone Asian store we had there (Manhatta, KS) and would make a meal of it with some plain steamed rice! I have one friend with whom I once worked with on night shift at a group-home; like me, she absolutely relished anything hot and sour, so I'd bring in tam som/som tam (Thai green papaya salad), nam prik wan (sweet chile-water) and fresh fruit, Indian pickles, xni-pec (Yucatan habanero salsa), kim chee, etc. Our co-workers who had dared try a smidgen (and went running for water) looked on with gaping mouths as we shoveled it in. Even my mother, who for a long time couldn't take much chile-heat, has now built up a fair tolerance; I got into the habit of preparing my everday dishes a bit hotter than she could manage (so she'd stick to her fried chicken and pork chops), but that isn't working anymore... :-( She hogged my last kutu. all those pics are very tempting. loved the grapefruit marmalade. okra salad sound different. Roopa, you sure could. But instead of swinging by, stay a while and have a cup of tea! It would be nice to connect considering that you are in the area! There are a couple more - Kitt's in Denver and Deepz is in Longmont. Maybe we could do a Front Range meet or something? Anita, and?! When are you going to share? A young handsome fella once came to dinner and he proceeded to put a piece of lemon in his mouth. It was a store-bought pickle. He turned red and had to be helped before he could breathe again. Which is why I always tell my visitors to nibble at the pickle and not eat it like American pickles. Crunch. Crunch. Crunch. Middle of the night pickle snacking occurs now. When I was "with child", I couldn't eat anything spicy and the smell of phodni used to make me nauseous. But I never threw up. I don't like to see my food again. And, yes, I added crushed red chilli flakes. What is all this pepper business? ;-) I just love what they do to the marmalade. I must admit eating it as is, no bread in sight! Pel, no recipe yet. Anita's Mom has one, maybe. Shilpa, the sun will shine again! You take care of more important things first. Shankari, you're most welcome! Did you come up with any variations? 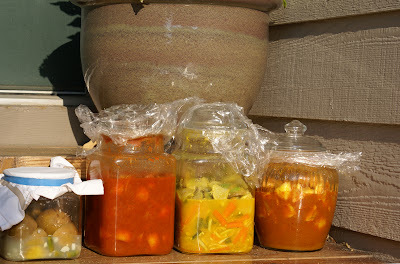 I am done with pickle making in the sun for this year but it could be something to try next year for sure! Mallugirl, the marmalade is getting less bitter as the days go by. Either that or we are getting used to it! It's yum on toast! Lots of pickle! I end up giving it away to friends so I figured I might as well make lots! Sharmi, if you don't enjoy bitter flavors, make orange or lime marmalade. 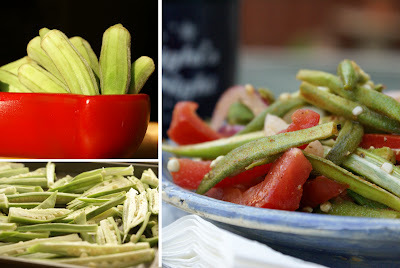 And definitely make the okra salad. It's very refreshing, especially in this heat! Priyanka, thanks! Let me know if you try any of these recipes and variations from my friends' blogs! 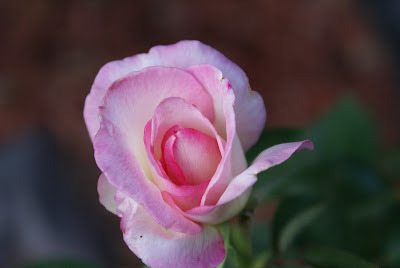 Manisha, I finally had your blog added to my Google reader. I could not when I added it last time so I have come here every so often to check for new posts! Give me more updates on the lemon pickle. Did you like the taste? Mine is all gone, getting ready for the next batch but the Meyer lemons were gone too but I am using the thin skinned green limes this time. ISG, spank that Google Reader and send in a complaint to Google! ;-) Do you really want to know about the lime pickle? I used lime and not lemons. I am in a real pickle about this and I could do with all the help I can get. Your recipe is fabulous so no worries there! It's me. Here goes: Since you said longer the better, I thought I would let the limes sit in the sun for a week. The monsoons have arrived here, too. And I have been very diligent about bringing the pickle jars in as soon as there is a sprinkle. Last Saturday, the chances of rain were 30%. We hardly ever see any rain when the chances are that low. A friend once said that there is an umbrella over the Boulder area and so we get less rain than areas closer to Denver. I had to rush out for some urgent stuff that had to be taken care of that day. I was miles away from home and it poured and stormed where I was. I got home and needless to say, it had rained very heavily at home, too. Since I am not as smart as Pel, I did not cover the lime jar with a plate nor did I think of it. Now several layers of that large man's handkerchief did a good job of holding the rain out, according to me. I could not see any change in the juices nor a change in taste. And, boy, does that lime taste great! As does the garlic and the green chillies. When I squeezed the hanky - which was appeared to be soaked - 4 drops of water came out. My husband is of the opinion that we should not eat the pickle as it now has rain water in it, which brings all the pollution down with it. I think that I should just go ahead and add the masala and the oil. But we go back and forth on this everyday and I really don't know what to do! Either that or I have to start from scratch. What do you folks think I should do? Until then, the jar goes out into the sun with the others. if that han,dkerchief was not dripping wet makes me think it absorbed the rainwater...you obviously didn't see any water on top of the pickle? Seems to me you should be fine. Those large man's handkerchiefs do come in handy! But, why do you not screw on the lid anyway right from the start? This step was new for me - i have always seen pickle jars screwed tight - the muslin my MIL tied was over the stoneware jars - to prevent dust from getting in? Nope, no signs of water anywhere in the jar, on the limes or on the layer of thickened juices. I used the handkerchief because I assumed that the jar needed to breathe some, instead of being air-tight. I've seen it done in India. And, yes, it was for barnis that did not have a tight lid. I'm hoping ISG can add some wisdom here. Or Pel. The lid is screwed on tight now! I add an extra layer of cling-wrap under the lid, just in case, to make it tighter. It's amazing but it tastes so good right now - and all it has is limes, garlic, green chillies and salt. If I have to make it again though, I'd make it with lemons instead of limes. Manisha, don't worry you are good. the large hanky would have kept out the dust if any. You don't have to cook it in the sun for more than a week as the skin is already softened from the hot water dunk. Showed my mom your dilema she says once you cook it in the oil for the final step it should be good. I vote for going forward. Why do you think lemons are better - less sour? Thank you, ladies! I looked up the panchang and the muhurat is scheduled for Saturday afternoon (after a quick run to the grocery store for nalla ennai). Yay! Anita, lemons are juicier and we like a lot of khaar in our pickles. I spread some on the deli sandwich or cheese sandwich that Medha takes for lunch. It adds a wonderful tang and a hint of spice to an otherwise bland sandwich. Now, that's an idea...I haven't done it on sandwiches though I like soft bread spread with achar khaar.